THERE was an old and poor man lived alone in the jungle. His wife passed away years ago and he did not have any children. Every day he collected some woods and sold them in the village. One day, the old man saw a beautiful antelope. The antelope was different from other antelopes. The color of the skin was golden. The old man walked slowly towards the antelope. The antelope looked very weak. He then gave the antelope some food. "Thank you, Sir. You are very kind to me," said the antelope. "You could talk? Who are you? Are you the ghost of the jungle?" the old man was very shocked. He was so surprised to see a talking antelope. "I'm sorry, old man. I can't tell you who I am. If I did, many people will hunt me. Just don't tell anyone about me, OK?" asked the antelope. 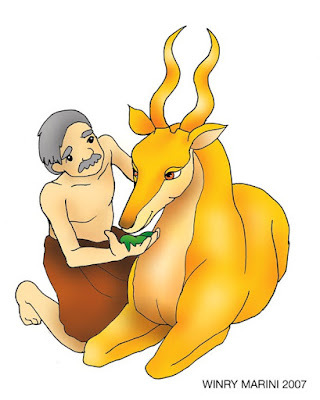 Since then the old man had a new friend, the golden antelope. He did not feel lonely anymore because he had a friend to talk now, it's the golden antelope. One day, the old man was ill. He could not collect the woods. "Don't worry. I will collect the woods for you," said the golden antelope. The golden antelope then went to the jungle. She did not know that some hunters were following her. One of the hunters was Prince Wijaya. Prince Wijaya took his arrow. He pointed it to the golden antelope. The arrow hit the antelope's body. Suddenly, smoke came out of the golden antelope's body. The smoke then was gone, later a beautiful girl appeared. "Thank you. You just released me from the curse. I'm Princess Sutha. A goddess cursed me into a golden antelope. I could turn back into human if a prince hit me with his arrow," she explained. Then Prince Wijaya asked her to go to the kingdom with him. Princess Sutha agreed only with one condition. She wanted the old man also to join them. Belum ada komentar untuk "The Golden Antelope"